The skin is the outer covering of the body. In humans, it is the largest organ of the integumentary system made up of multiple layers of mesodermal tissue, and guards the underlying muscles, bones, ligaments and internal organ. Skin of a different nature exists in amphibians, reptiles, birds. Human skin is not unlike that of most other mammals except that it is not protected by a pelt and appears hairless though in fact nearly all human skin is covered with hair follicles. The adjective cutaneous literally means "of the skin" (from Latin cutis, skin). Skin has mesodermal cells, pigmentation, or melanin, provided by melanocytes, which absorb some of the potentially dangerous ultraviolet radiation (UV) in sunlight. It also contains DNA-repair enzymes that help reverse UV damage, and people who lack the genes for these enzymes suffer high rates of skin cancer. One form predominantly produced by UV light, malignant melanoma, is particularly invasive, causing it to spread quickly, and can often be deadly. Human skin pigmentation varies among populations in a striking manner. This has led to the classification of people(s) on the basis of skin color. The skin is the largest organ in the human body. For the average adult human, the skin has a surface area of between 1.5-2.0 square meters (16.1-21.5 sq ft.), most of it is between 2–3 mm (0.10 inch) thick. The average square inch (6.5 cm²) of skin holds 650 sweat glands, 20 blood vessels, 60,000 melanocytes, and more than a thousand nerve endings. Absorption: Oxygen, nitrogen and carbon dioxide can diffuse into the epidermis in small amounts, some animals using their skin for their sole respiration organ (contrary to popular belief, however, humans do not absorb oxygen through the skin). In addition, medicine can be administered through the skin, by ointments or by means of adhesive patch, such as the nicotine patch or iontophoresis. The skin is an important site of transport in many other organisms. The skin supports its own ecosystems of microorganisms, including yeasts and bacteria, which cannot be removed by any amount of cleaning. Estimates place the number of individual bacteria on the surface of one square inch (6.5 square cm) of human skin at 50 million, though this figure varies greatly over the average of human skin. Oily surfaces, such as the face, may contain over 500 million bacteria per square inch (6.5 cm²). Despite these vast quantities, all of the bacteria found on the skin's surface would fit into a volume the size of a pea. In general, the microorganisms keep one another in check and are part of a healthy skin. When the balance is disturbed, there may be an overgrowth and infection, such as when antibiotics kill microbes, resulting in an overgrowth of yeast. The skin is continuous with the inner epithelial lining of the body at the orifices, each of which supports its own complement of microbes. The goal of treating oily skin is to remove excess surface sebum without complete removal of skin lipids. Severe degreasing treatment can foster an actual worsening of sebum secretion, which defeats the aim of the cleansing. A method of cleansing oily skin is to cleanse with a natural face cleanser formulated especially for oily skin. The cleansers pH should be 4.5 - 5.5, since the skin's pH value is approximately 5.4. Gel cleansers work best on oily skin. (see: surfactant) Oily skin products should contain very little natural oils. They should not contain waxes or other synthetic lipid agents that could aggravate the oily condition of the skin. A toning lotion should also be natural and have a pH of 4.5-5.5 and formulated especially to help balance and hydrate oily skin. Some cleansing products have lower concentrations of hydroxy acids, which remove dead cells from the upper levels of the stratum corneum. Those products should be used on a regular basis to work adequately. Among other things, skin aging is noted by a decrease in volume and elasticity. There are many internal and external causes to skin aging. For example: Aging skin receives less blood flow and lower glandular activity. Cortisol causes degradation of collagen, accelerating skin aging. Photoaging has two main concerns: an increased risk for skin cancer and the appearance of damaged skin. In younger skin, sun damage will heal faster since the cells in the epidermis have a faster turnover rate, while in the older population the skin becomes thinner and the epidermis turnover rate for cell repair is lower which may result in the dermis layer being damaged. Individuals with ancestors from different parts of the world can have highly visible differences in skin pigmentation. Individuals with sub-Saharan African ancestry (black people) tend towards darker skin, while those of Northern European descent (white people) have paler skin. Between these extremes are individuals of Asian, South-East Asian, Native American, Middle Eastern, Polynesian and Melanesian descent. The skin of black people has more variation in color from one part of the body to another than does the skin of other racial groups, particularly the palms of the hands and soles of the feet. Part of this is the result of the variations in the thickness of the skin on different parts of the body. The thicker the skin, the more layers of cells with melanin in them, and the darker the color. In conclusion, these parts of the body have melanin-producing cells. Darker skin hinders UVA rays from penetrating. Because UVA degrades folate (a B vitamin) and is required for vitamin D synthesis, people with darker skin tones are more susceptible to deficiencies of these vitamins. The human skin is a rich environment for microbes. Around 1000 species of bacteria from 19 bacterial phyla have been found. Most come from only four phyla: Actinobacteria (51.8%), Firmicutes (24.4%), Proteobacteria (16.5%), and Bacteroidetes (6.3%). Propionibacteria and Staphylococci species were the main species in sebaceous areas. There are three main ecological areas: moist, dry and sebaceous. In moist places on the body Corynebacteria together with Staphylococci dominate. In dry areas, there is a mixture of species but dominated by b-Proteobacteria and Flavobacteriales. Ecologically, sebaceous areas had greater species richness than moist and dry one. The areas with least similarity between people in species were the spaces between fingers, the spaces between toes, axillae, and umbilical cord stump. Most similarly were beside the nostril, nares (insidethe nostril), and on the back. The term skin refers to the covering of a small animal, such as a sheep, goat (goatskin), pig, snake (snakeskin) etc or the young of a large animal. Skins and hides from different animals are used for clothing, bags and other consumer products, usually in the form of leather, but also furs. Skin can also be cooked to make pork rind or cracklin. The skin on roasted chicken and turkey is another coveted delicacy. the hypodermis (subcutaneous adipose layer). The epidermis contains no blood vessels, and cells in the deepest layers are nourished by diffusion from blood capillaries extending to the upper layers of the dermis. The main type of cells which make up the epidermis are Merkel cells, keratinocytes, with melanocytes and Langerhans cells also present. The epidermis can be further subdivided into the following strata (beginning with the outermost layer): corneum, lucidum (only in palms of hands and bottoms of feet), granulosum, spinosum, basale. Cells are formed through mitosis at the basale layer. The daughter cells (see cell division) move up the strata changing shape and composition as they die due to isolation from their blood source. The cytoplasm is released and the protein keratin is inserted. They eventually reach the corneum and slough off (desquamation). This process is called keratinization and takes place within about 27 days. This keratinized layer of skin is responsible for keeping water in the body and keeping other harmful chemicals and pathogens out, making skin a natural barrier to infection. The epidermis contains no blood vessels, and is nourished by diffusion from the dermis. The main type of cells which make up the epidermis are keratinocytes, melanocytes, Langerhans cells and Merkels cells. The epidermis helps the skin to regulate body temperature. Epidermis is divided into several layers where cells are formed through mitosis at the innermost layers. They move up the strata changing shape and composition as they differentiate and become filled with keratin. They eventually reach the top layer called stratum corneum and are sloughed off, or desquamated. This process is called keratinization and takes place within weeks. The outermost layer of the epidermis consists of 25 to 30 layers of dead cells. The dermis is the layer of skin beneath the epidermis that consists of connective tissue and cushions the body from stress and strain. 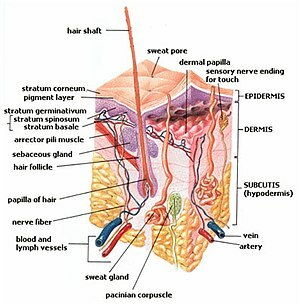 The dermis is tightly connected to the epidermis by a basement membrane. It also harbors many Mechanoreceptor/nerve endings that provide the sense of touch and heat. It contains the hair follicles, sweat glands, sebaceous glands, apocrine glands, lymphatic vessels and blood vessels. The blood vessels in the dermis provide nourishment and waste removal from its own cells as well as from the Stratum basale of the epidermis. In the palms, fingers, soles, and toes, the influence of the papillae projecting into the epidermis forms contours in the skin's surface. These are called friction ridges, because they help the hand or foot to grasp by increasing friction. Friction ridges occur in patterns (see: fingerprint) that are genetically and epigenetically determined and are therefore unique to the individual, making it possible to use fingerprints or footprints as a means of identification. Tattoo ink is held in the dermis. Stretch marks from pregnancy are also located in the dermis. The epidermis of fish and of most amphibians consists entirely of live cells, with only minimal quantities of keratin in the cells of the superficial layer. It is generally permeable, and, in the case of many amphibians, may actually be a major respiratory organ. The epidermis of birds and reptiles is closer to that of humans, with a layer of dead keratin-filled cells at the surface, to help reduce water loss. A similar pattern is also seen in some of the more terrestrial amphibians, such as toads. However, in all of these animals there is no clear differentiation of the epidermis into distinct layers, as occurs in humans, with the change in cell type being relatively gradual. The mammalian epidermis always possesses at least a stratum germinativum and stratum corneum, but the other intermediate layers found in humans are not always distinguishable. The dermis of bony fish typically contains relatively little of the connective tissue found in tetrapods. Instead, in most species, it is largely replaced by solid, protective bony scale. Apart from some particularly large dermal bones that form parts of the skull, these scales are lost in tetrapods, although many reptiles do have scales of a different kind, as do pangolins. Cartilaginous fish have numerous tooth-like denticles embedded in their skin, in place of true scales. Hair is a distinctive feature of mammalian skin, while feathers are (at least among living species) similarly unique to birds. Although melanin is found in the skin of many species, in reptiles, amphibians, and fish, the epidermis is often relatively colourless. Instead, the colour of the skin is largely due to chromatophores in the dermis, which, in addition to melanin, may contain guanine or carotenoid pigments. Many species, such as chameleons and flounders may be able to change the colour of their skin by adjusting the relative size of their chromatophores. "Skin care" (analysis), Health-Cares.net, 2007, webpage: HCcare. Grice EA, Kong HH, Conlan S. (2009). Topographical and Temporal Diversity of the Human Skin Microbiome, Science, 324: 1190 - 1192. Marks, James G; Miller, Jeffery (2006). Lookingbill and Marks' Principles of Dermatology (4th ed.). Elsevier Inc. ISBN 1-4160-3185-5. Smith, Wilma and Burns, Catherine. (1999) "Managing the hair and skin of African American pediatric patients." Journal of Pediatric Health Care 13(2):72-8.